The 4-star Mercure Manchester Norton Grange Hotel and Spa is set amongst tranquil countryside within its own beautiful landscaped gardens. Situated just eight miles from the city centre, this hotel is perfect for weekend breaks, shopping days and business stopovers. Enjoy a carefully prepared meal in the elegant Grange Restaurant, or relax in the less formal atmosphere of the Pickwick Bistro. Privilege rooms are available to complete any special stay, offering robes, slippers and luxury toiletries. The hotel boasts 11 versatile function rooms which can accommodate up to 220 guests; ideal for conferences, weddings and more. Relax and recharge in the spa, or enjoy a round of golf at Manchester Golf Course, conveniently located opposite the hotel. In addition to this, the hotel is located just minutes away from transport links into the city centre, and is less than a mile in distance from the M62. Guests will be pleased to have access to the city from this tranquil and comfortable hotel. 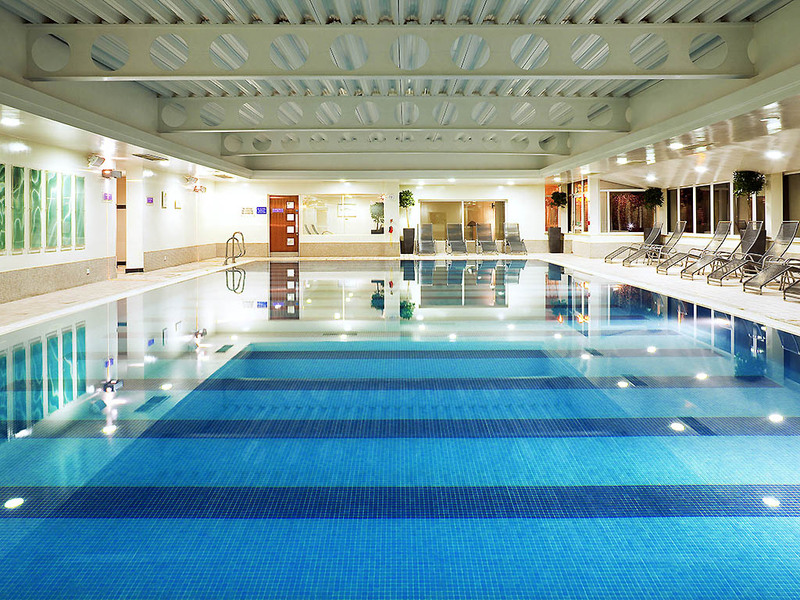 Mercure Manchester Norton Grange Hotel and Spa is a 4-star hotel, set in its own landscaped grounds. Located just minutes away from transport links into the city centre the hotel is less than a mile from the M62 and just 8 miles from central Manchester. The hotel has 81 contemporary rooms, all with wireless internet and satellite TV. Some executive rooms are available which are decorated and fitted to very high standards and include complimentary bathrobes, mineral water, designer toiletries and a four-piece bathroom suite. The Grange restaurant offers formal dining in style whilst Pickwick Bistro provides a more informal setting. The Pickwick Bistro offers a more informal dining option to the Restaurant, serving a range of lighter meals and snacks. I was assured that on arrival I would be able to pay for a late checkout,I was refused at check in by the receptionist,stating “we were very busy and it was not possible.”When we went down to breakfast the offering was limited,no eggs other than dried up rock hard whites,no beans just tomato sauce,the sausage were dried up ,the bacon inedible,the tables were unclean and the coffee was cold,considering you charge £15 per person I believe this was also poor quality and value. We were all family and extened family. We felt completely at home. The staff were very helpful, obliging and courteous. The hotel was very clean and to our expectation. We are happy that we booked our stay at Norton Grange, as well as for having our daughter's wedding reception there. Thanks to all your staff and all involved in making our stay there a comfortable one. The room was nice and big but the furniture and carpet old and outdated! The gym facility and sauna was very beneficial for me as this is a must while I'm away on business. The breakfast was also very nice. The hotel needs updating, it is very old and tired. The staff were great and helpful apart from the lady in the Bar, on our arrival we had lunch in the bar and the young lady who served us did not smile or make us welcome at all. As we were the only customers ordering food and drinks it was not as though she was run off her feet. The Spa was lacking in facilities which was not mentioned before our booking although it was a last minute booking. We have stayed at The Norton Grange at least twice before but this time were really disappointed in a few ways. The usual lift was out of order so we had to use the one near the spa. On the dresser-top was a plate of some kind of cake and 2 strawberry halves with a card propped up against it saying "Eat Me". ... very odd. There was a layer of dust on the floor lamp base, one bedside lamp had a wonky shade and the bathroom towel rail had a " do not use" electrical safety sticker and exposed wiring. Breakfast fried eggs would have made great frisbees too. All in all the place seemed unloved and not how we'd found it to be previously. All new and old staff very pleasant helpful and very willing to help, however, the food is still very average, and hit and miss by day, for example, not all ingredients are used in the superfood salad. Overall it was great but my husband hurt himself in the shower as there were no non-slip mats to put down in the bath and he ended up with a bruised knee when he slipped in the shower. We booked this hotel as we were going to a football match in Rochdale. The location was excellent and £8 in a taxi to the football ground. Hotel set in very pleasant surroundings. It was spotlessly clean and the thermal spa/pool area was one of the best we've stayed at. Again beautifully clean. Breakfast was very nice in a lovely spacious room. Room etc was fine, told at reception my card was on file for food etc. Order room service and they call back to tell me to go down to reception as my card isn’t authorised they should have done this at check in, I explained I have a disability and am struggling walking, hence ordering room service and would be able to make the walk from the back of the hotel to reception. Call reception and ask if they can authorise itover the phone and told yes no problem. They called back to say actually I would need to go down as they need the card in person. Had a conversation where I explained again I could not come down, can I just pay for dinner as a card payment over the phone instead of authorising my card. Was told no. Explained I’m sorry I’ll have to either cancel my food or pay when I check out as I’m in a great deal of pain. Went round and round in circles until he said “fine so you want to pay tomorrow” clearly annoyed. I said I was happy for him to cancel the food, I was told my card was ready to order room service before going to my room but was told it was too late they’d told the kitchen it had been approved. Although I understand there was a genuine mistake I felt uncomfortable that they kept insisting I come downstairs to fix this despite explaining I have a disability, I’m struggling to walk and it’s a long way from my room, hence I’m ordering room service instead of joining colleagues in the restaurant. I understand they would not want to give food without payment however I offered to cancel my order and to pay via card over the phone instead of the preauthorising. The next morning I mentioned at reception and they said no everything had been settled and it had been charged to my card rather than through the authorisation process. If this was possible why was I made to feel guilty for being unable to come downstairs and pay by card in person? Two work related trips were made all the better by staying at Norton Grange. Its a fabulous hotel and with a really amazing spa. Lovely newly decorated rooms with nice facilities. I did not stay here, I keep getting notifications that I did. I live in the United States. I did not stay here, I keep getting notifications that I did. I live in the United States. I tried letting the company know that there may be some fraudulent activity going on as I didn't stay at this hotel but nobody seems to get the message or listen. Please let me know if someone is posing as me, using my identity, or stealing from me financially. The hotel is fine and the staff are pleasant. the rooms are also fine. Two things really the food was not great and we had to wait until 9.50pm for our main courses. the gym is also in dyer need of updating. A bit less than I’d hoped for. There were some good bits - clean room, comfy bed and good pillows. The layout of the bathroom made it very snug so the door crashed on to the washbasin if you weren’t careful. There were nice big fluffy bath towels. The curtains in the room needed cleaning, but in fairness to housekeeping this was only apparent when the curtains were closed. A lighter breakfast choice was not really possible. I waited 20 mins for a poached egg which arrived on a cold side plate and was raw in the middle. There was a good choice of jams. Staff were helpful - I was directed to the local Tesco for a sandwich after waiting to be served in the lounge bar for 30 mins. It would have been nice if the receptionist had held the doors (3 sets) open on arrival so I didn’t have to struggle with 2 wheeled bags. It was not pleasant having to walk through the crowds of smokers right outside the front doors of the hotel. First night I would say good value, the second night the price increased significantly - not good value. Lovely accommodation, very friendly staff. Rooms exceptionally clean. Spa facilities were good. Sadly a couple of issues. No chairs/beds available in spa and there was a 75yr old lady with us, staff did provide an extra chair for her but the rest of our party had none. Robes were missing from rooms and service in the bar was very slow, had to ask several times about a coffee ordered.